Following his “prebuttal” of the President’s State of the Union Address yesterday, Mitt Romney appeared on Fox and Friends this morning to give his “postbuttal” (What? That’s just called a “rebuttal”? Oh, I see). 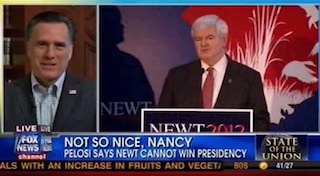 However, the conversation soon turned to Romney’s highest polling opponent in the GOP nomination race, Newt Gingrich. And, while Romney seemed more interested in talking about President Obama (apparently our president is “trying to save his job by tearing down Americans”), he did let loose with a few choice zingers about his GOP rival. The Friends got the comments out of him by complimenting his most recent debate performance in comparison to the couple that gave Gingrich such a surge. Romney went off on those debates and perceived notion that Gingrich’s boost was caused by his attacks on John King and Juan Williams. Gretchen Carlson then asked Romney what he thought of Nancy Pelosi’s claim that she “knows” something that will keep Gingrich from being president. Romney continued by saying that the full records from the ethics investigation on Gingrich in the 90s needed to be released because, if Pelosi knows them, she will assuredly give them to Obama’s campaign.